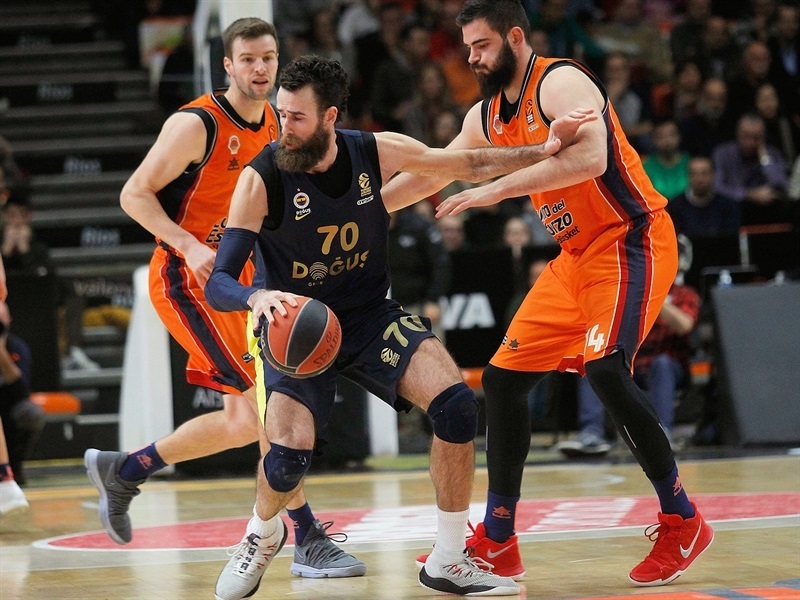 In a rollercoaster game of runs, reigning champion Fenerbahce Dogus Istanbul used a strong finish to pull away for an important 67-80 road win at Valencia Basket on Thursday night. 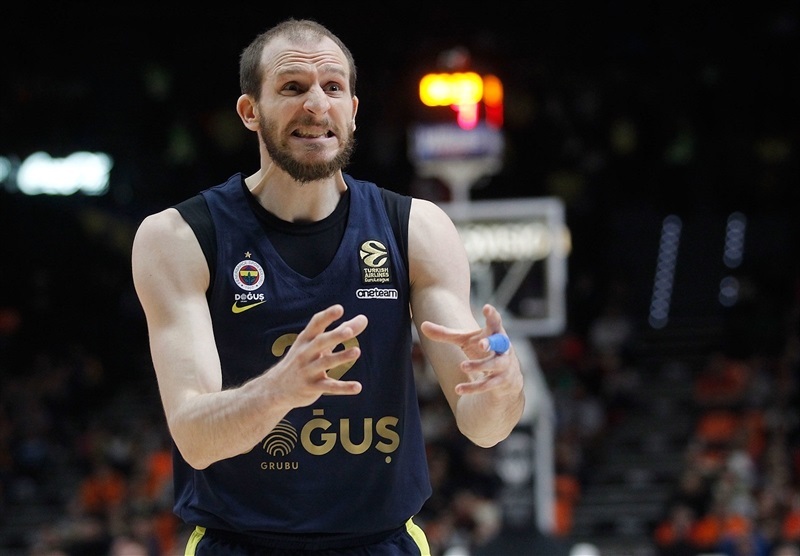 Fenerbahce, playing without Jan Vesely, Nikola Kalinic and James Nunnally, improved to 11-6 to remain in at least a share of fourth place in the standings, while Valencia dropped to 5-12. 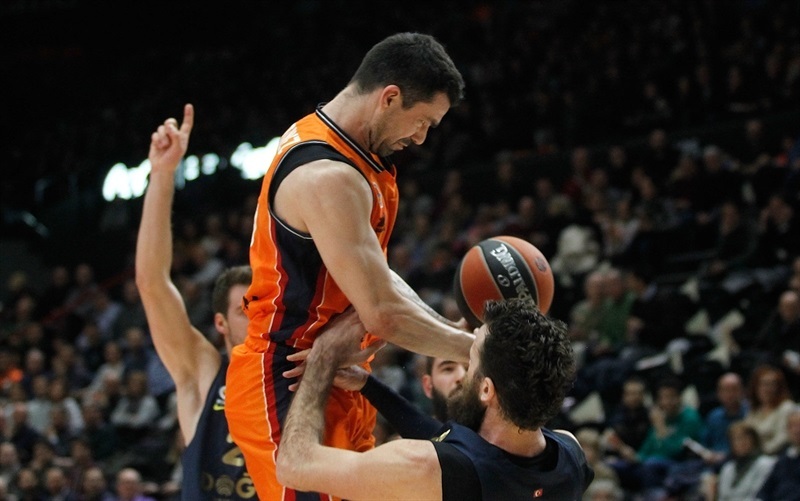 Fenerbahce scored the first 15 points of the game, but Valencia erased the deficit by the third quarter and went up 47-39. However, it was all Fenerbahce after that as Kostas Sloukas got the visitors going and orchestrated a comeback. 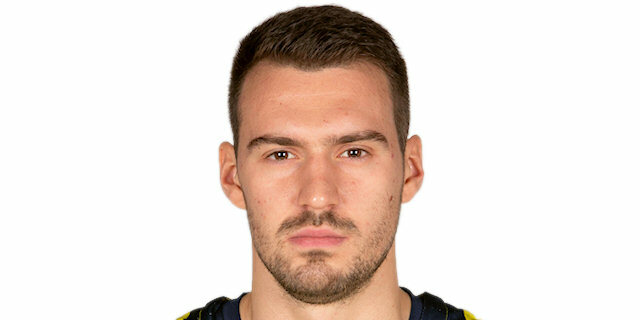 Sloukas finished with 11 points and 10 assists, while Marko Guduric led Fenerbahce in scoring with 15 points. Luigi Datome netted 14 points, Jason Thompson had 13, and Ahmet Duverioglu scored 10 on 5-for-5 shooting from the field. 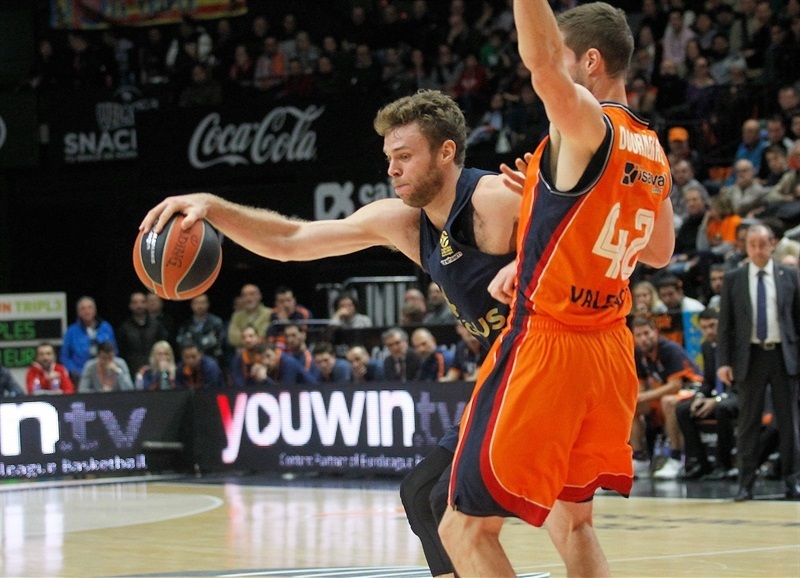 Nicolo Melli pulled down 11 rebounds and had 4 steals in the winning effort. 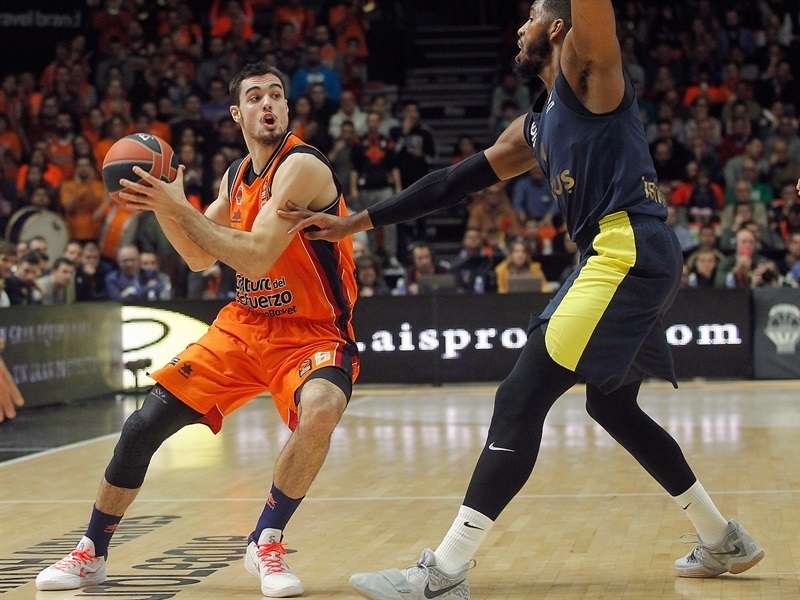 Alberto Abalde scored 11 points for Valencia, and Tibor Pleiss finished with 10 in defeat. Neither team scored in the opening two and a half minutes, only for Fenerbahce to score 15 unanswered points while keeping the defensive stand going. Ali Muhammed and Datome hit triples, Melli had a jumper and a tip-in, and Guduric had a three of his own during the run. Valencia missed its first 11 shot attempts before Sergio Garcia, making his debut, hit a three-pointer with 2:22 to go in the first quarter. Garcia added a runner, and Pleiss scored inside as the hosts halved the deficit. 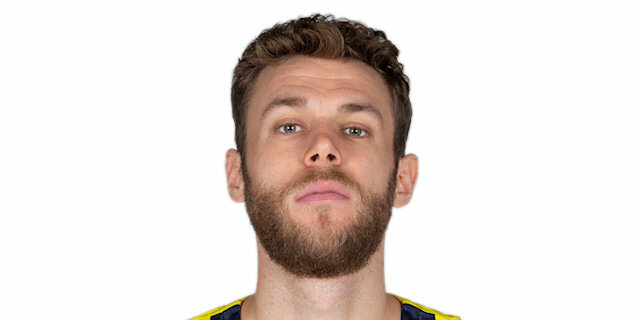 Fenerbahce had shooting struggles of its own, but Datome hit a triple in the final minute of the first quarter and the opening minute of the second to open a 7-21 lead. Damjan Rudez hit a three-pointer and assisted on a Pleiss dunk. 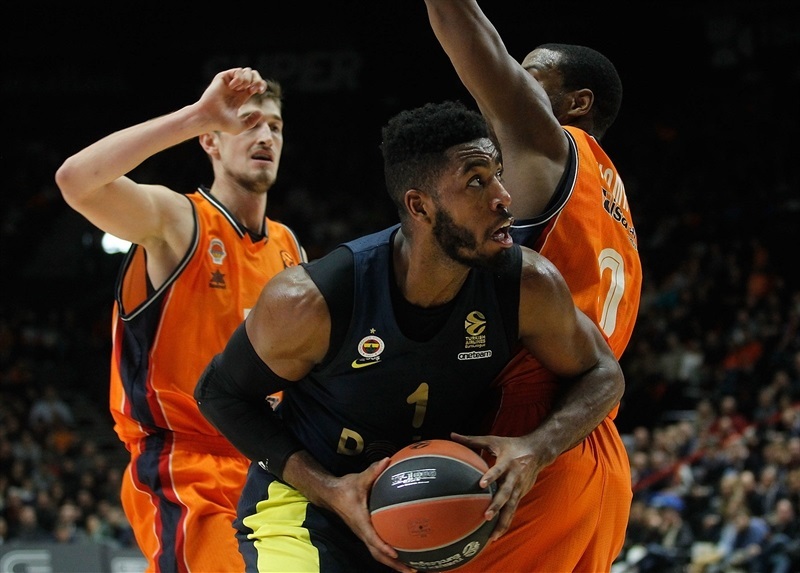 A three-point play by Rafa Martinez cut the deficit to 19-27, and after Guduric and Thompson pushed the margin back to the double figures, the hosts held Fenerbahce without a basket in the final four and a half minutes of the half. Valencia scored the final 6 points of the quarter to get to halftime down 27-33. 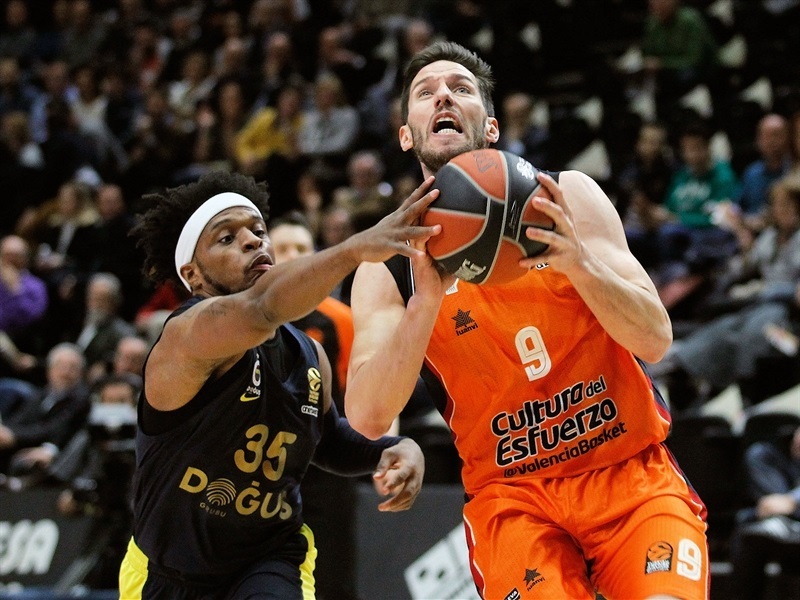 Aaron Doornekamp and Muhammed opened the second half trading triples, only for Sam Van Rossom to hit another one from downtown for Valencia. Abalde added a three-point play that tied things at 36-36. Abalde’s fastbreak layup put Valencia in front and after a three-point play on the other end by Thompson, Bojan Dubljevic and Doornekamp hit back-to-back threes as the hosts went in front 47-39. 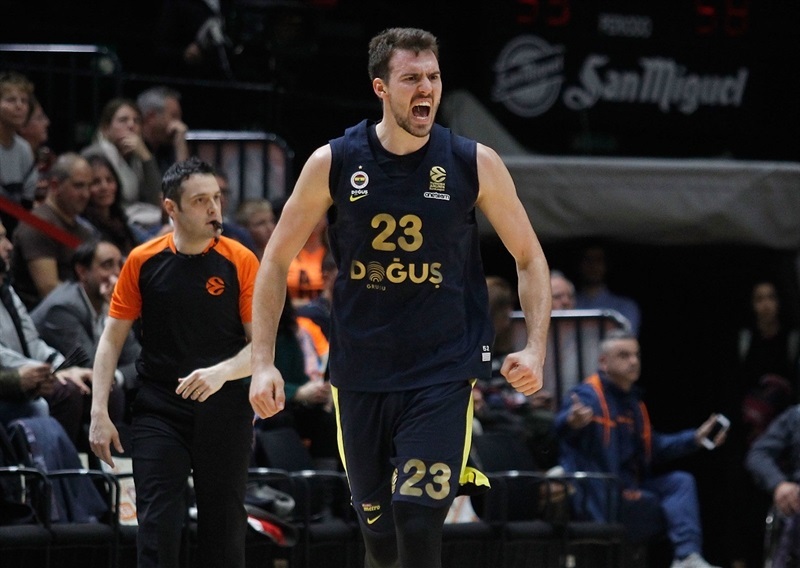 However, Sloukas had a pair of baskets that got Fenerbahce right back in it, and close-range buckets from Melli and Duverioglu gave the visitors a 50-51 edge going into the final quarter. 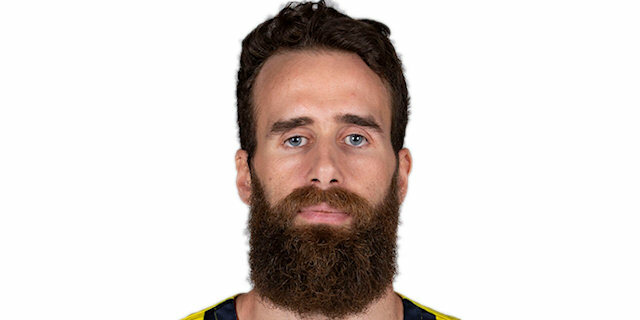 A triple from Van Rossom tied it at 53-53, but it was all Fenerbahce from there. Datome and Guduric each hit threes, Duverioglu worked his way inside to score twice and Sloukas hit a three-pointer to open a 55-66 lead. A jumper and a triple from Melih Mahmutoglu increased the margin to 57-73, capping a 4-20 charge and sealing the outcome with less than three minutes to go. "The first quarter we had difficulties; we missed our first open shots and after really good defense, we lost confidence and we started the game with 0-15. After this situation, in the first seven minutes, we made a good comeback, played good basketball on offense and defense. But in the last two minutes of the third quarter, and in the fourth, we missed open shots, made turnovers, and our changed readings on defense changed. It was a key. 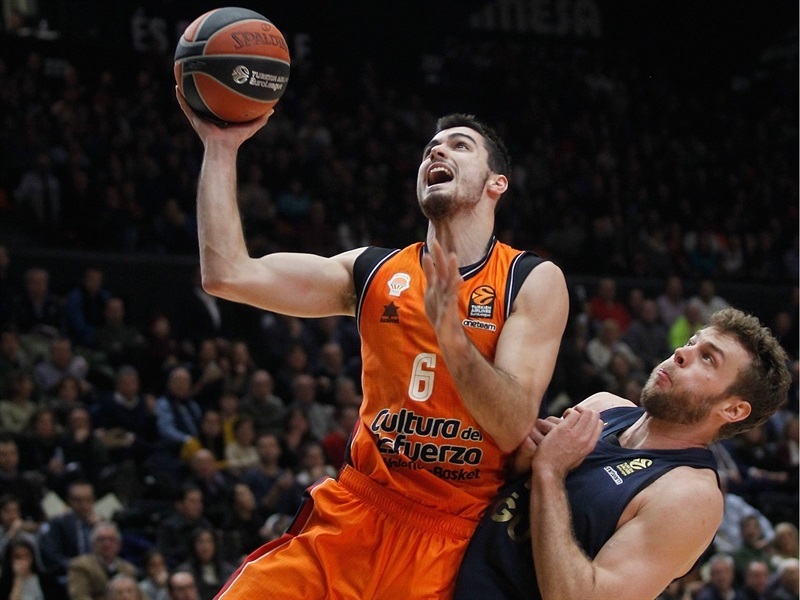 Sloukas is a great player, one of the most important point guards in European basketball and he controlled the last quarter, and that was the key. 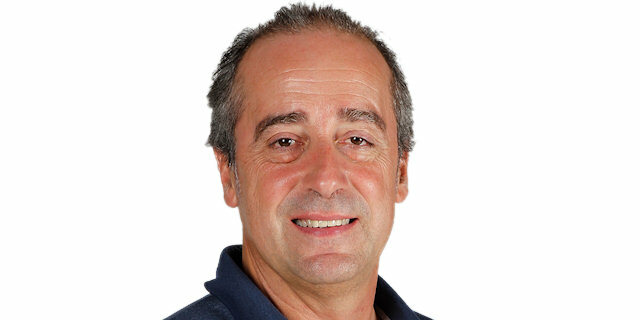 If Sloukas plays comfortable, it is hard for us to have chances to win." "We started the game in a very positive way, having a 0-15 lead in the beginning of the first quarter. 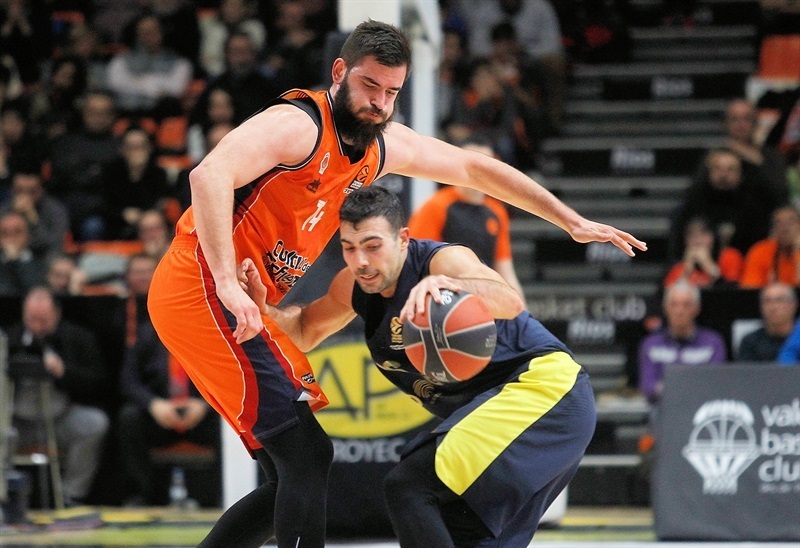 It was obvious Valencia will try to come back, playing on home court and in front of its fans. Our reaction was good in the first half, but very bad in the third quarter. It is something that happens to my team a lot of times this season, and I am trying to understand why we have so many ups and downs. In the fourth quarter, our defense was really good, with some steals and taking care of their most important players. And finally, finally, we started to read Valencia’s defense and because of that we scored some really easy shots. Valencia has a lot of injured players and it is not easy for them, and I think in this situation, they played good basketball." "We played very good at the beginning, then we lost ourselves a little bit and complicated our life a little bit. Valencia had a big, big run. We cannot allow opponents to have such runs when we are up. At the end of the day we won the game, the end result was good for us. We have a lot of work to do and the road in front of us is still long. But we won, which was the main goal for tonight." "It is a big win for us on the road. We need to try to make a run, and I hope we are going to keep this winning streak alive. 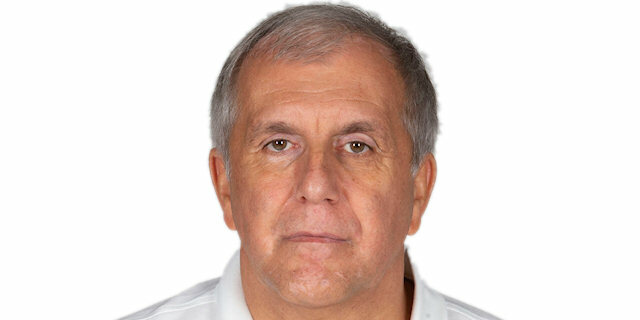 We have to work to do to find a way to play without Jan Vesely and James Nunnally." "I didn’t like that we were up 0-15, then had such a big break. We suffered. But it is a part of the game, it can happen. But we stuck together and we have to do that every time, whether we are winning or losing. We started to make good choices on offense, moving the ball and finding the open men. Point guards were good in finding the right guy to feed and the right mismatch to attack."